The centre, led by Dr Anastasios Polyzos from the School of Chemistry, is funded by the Australian Research Council with a provision of $3.3 million over five years to support advances in chemical manufacturing and create new commercial opportunities for, and increase the competitiveness of, Australia in sectors including agriculture, medicine, construction and transport. It is led by the University of Melbourne in collaboration with the University of New South Wales, Swinburne University of Technology and participating organisations including Chemistry Australia; Commonwealth Scientific and Industrial Research Organisation; Duluxgroup (Australia); Qenos; PPG Industries; and the Trustee for DCS Technical Trust. As part of the training centre, a brand-new Master of Industrial Research (Chemistry) course at the University has been created and will start taking students from 2019. It is a 2-year course which includes coursework and a significant research project with a chemical company, usually conducted at their sire, working with their staff, to give a minimum of 12-months’ experience as an industrial R&D chemist. Read more about student opportunities in the training centre website. (from left to right): Professor Martina Stenzel (Centre Co-Director) Professor Andrew Holmes AC, Professor Laura Parry (Deputy Dean, Faculty of Science), Senator James Paterson, Dr Tash Polyzos (Centre Director), Professor Sue Thomas (CEO of the ARC), Professor Aleks Owczarek (Deputy Dean, Faculty of Science). Minister Dan Tehan said that the chemical industry is Australia’s second largest manufacturing sector and is an important contributor to our economy and employment opportunities. “This new ARC Training Centre will undertake industry-led research to transform Australia’s chemical manufacturing technologies and create new commercial products, such as new medicines, improved paints and robust plastics,” Mr Tehan said. Senator Paterson said the new centre will address a skills gap by providing important opportunities for early career researchers to gain ‘real-world’ research experience in an industry setting. “The new ARC Training Centre will help address the chemical industry’s need for highly-skilled STEM graduates that are equipped with excellent academic training, as well as relevant industry skills and experience,” Senator Paterson said. 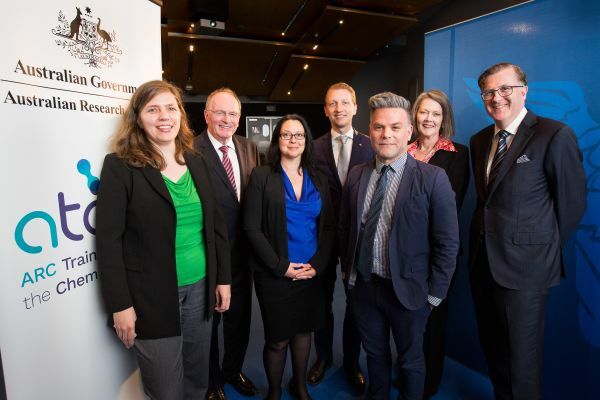 University of Melbourne Vice-Chancellor Glyn Davis welcomed the new ARC Training Centre, which he said would “significantly boost STEM opportunities for early career STEM graduates and build closer links between graduates and employers”. “The Centre provides an important bridge between University of Melbourne researchers, the community and STEM employers,” Professor Davis said. The University of Melbourne has been awarded a total of $10.5 million to establish this and two other training centres. Read more about them in the Melbourne Newsroom. These centres are part of 9 which are funded by the government through the ARC’s 33 scheme which fosters close partnerships between university-based researchers and other research end-users to provide innovative Higher Degree by Research (HDR) and postdoctoral training opportunities that are industry-focused.